Cute Teddy in Halloween pumpkin costume ready for the party. Cartoony design of the sun smiling down. Stitched with warm red, orange and yellow floss. 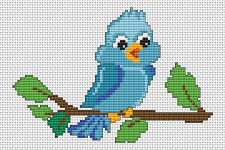 Cute little blue bird on a tree-branch.The chart contains full stitches and back stitches. Let it snow! Everyone has favorite things to do.Cute teddy bear riding on ice skates. Fun cross stitch pattern of the penguin Tux wearing a Christmas hat. 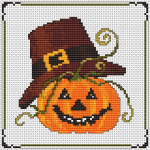 Funny Halloween pumpkin pattern.This pattern uses 10 DMC thread colors. Halloween pattern of a cute kitten next to a pumpkin. 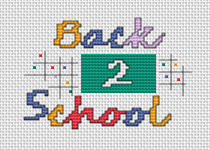 Time to go back to school.This pattern uses bright colors,full stitches and back stitches.Suitable for cards making. 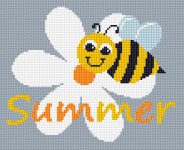 Enjoy your summer with this cute bee collecting nectar from the flowers. Cross stitch pattern of a baby teddy bear holding balloons. Cute cross stitch pattern of a funny cat and the text:"To my staff:Home is where I am"